If you'd like to vacation in Fitzroy Island, be sure to pre-plan, as you won't find a wide range of hotel options near Fitzroy Island's downtown. The Fitzroy Island Resort is an ever-popular choice for visitors as it is the most centrally positioned hotel option in Fitzroy Island. The Australis Cairns Beach Resort is situated 30 kilometres from the middle of Fitzroy Island. Alternatively, the Palm Royale Cairns is 25 kilometres away. If you'd prefer, you could check out the amenities and rates at the Cairns Southside International or the Reef Palms Motel. You'd be a goose to leave Fitzroy Island without seeing the other things on offer in Tropical North Queensland. Tropical North Queensland is known for beaches, along with commonly visited Tropical North Queensland destinations like the art galleries and craft workshops. In this region of Australia, travellers might try their hand at rock climbing, mountain climbing and hiking. It's well known that we Aussies are pretty laid back, so consider staying a little longer and check out the Cairns Esplanade, Reef Hotel Casino and Esplanade Lagoon, which you'll find in Cairns, 25 kilometres to the west of Fitzroy Island. 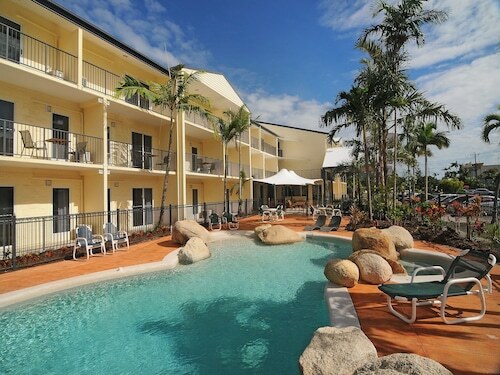 Some of our recommended Cairns hotels include the Cairns Colonial Club Resort and Cairns Sheridan Hotel. Or, you could consider staying in Yorkeys Knob, 30 kilometres to the west of Fitzroy Island, where you'll find the Blue Lagoon Resort and Sea Change Beachfront Apartments. The Half Moon Bay Golf Course and Yorkeys Knob Beach are some of the most popular attractions to check out when you're in Yorkeys Knob. Australians are world renown for their passion for sport, so why not visit Barlow Park? Find Barlow Park around 25 kilometres to the west of Fitzroy Island. For those who fancy booking a bed close by, make a reservation at the Palm Royale Cairns or the Cairns Southside International. If you're flying into or out of Cairns International Airport and plan to stay nearby, check out the latest deals at the Australis Cairns Beach Resort or the Reef Palms Motel. How Much is a Hotel Room in Fitzroy Island? Hotels in Fitzroy Island start at AU$123 per night. Prices and availability subject to change. Additional terms may apply. It is not new, but comfortable. Staff are friendly. Room was cleaned everyday. Good to eat in.